This Home Is Where Your Story Begins Decal is a RoomMates Peel & Stick Home Quote Wall Sticker. Free delivery over R500 in South Africa plus free heart decals too. This Home Is Where Your Story Begins Decal is printed in black on clear material. If positioned like main photo, this RoomMates Peel and Stick Home Is Where Your Story Begins Wall Art Decal measures approx. 53cm x 20cm (h). – Repositionable: Roommates Decals can be repostioned (if you make a mistake) or want to move them around the room. Also, if you move home, you can just reapply them back onto their original backing sheet for re-use! – Words (smallest is 7cm x 3.5cm and largest is 28.5cm x 13cm): Home, is, where, your, story, begins – in black (each comes separately so you can position them as you wish). – FREE: 6 heart decals (each is approx. 3cm) – one shown in the main and all shown on sheet photo. Liven up your home or Gallery Wall with these motivational and inspirational RoomMates Decor “Quotables” Decals. 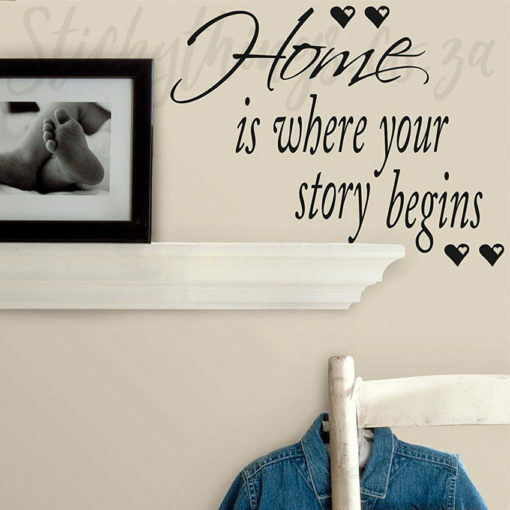 Each Home Is Where Your Story Begins Home Wall Decal word is individually cut to allow for maximum versatility and flexibility when it comes to decorating your space. Works on all smooth, clean, and dry surfaces. And unlike stencils or permanent rub-on transfers, RoomMates wall decals remove instantly with no sticky residue or damage to the surface. You may also like our other Quote Wall Stickers as well. Plus, get 6 Heart decals for free (as shown in main photo)! Average Installation Time: 30 minutes (we also recommend laying them flat for at least a day before using them).